MetalTac 0.20g BBs convincingly demonstrate the pinnacle of craftsmanship. With you, the airsoft player, always in their mind, MetalTac has created an incredibly well designed airsoft pellet that thousands of players will happily use on their beginner and intermediate airsoft guns. Their well executed manufacturing process immediately translates into an awesomely consistent performing airsoft pellet that travels true and hits its target with precisely engineered vigor. Boosting the reputation of 0.20g BBs to unseen hights, MetalTac 0.20g BBs stand to make their name known among their long established competitors. 0.20g BBs are a very heavily used pellet weight in today’s airsoft world. They are often bought and used on all kinds of electric rifles, SMG’s, pistols and even some low-end snipers. MetaltTac BBs best fit airsoft guns that shoot in the FPS range of 280-350. This range defines a big chunk of beginner airsoft AEG’s and up to mid-priced guns. Moving up in price and quality, guns will start performing better with heavier weights – 0.25g and 0.28g. For the most part, guns below $150 are most likely to shoot straight and true with MetalTac BBs. Though every gun is unique, you should have no issues if you stick to the 280-350 FPS range guns. 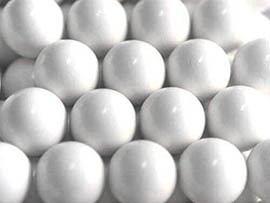 Despite their name, MetalTac’s are 0.20g 6mm pearl white plastic BBs. They are clean and highly polished, resulting in a shiny appearance. Both their diameter (5.95) and weight (0.20g) enjoy minuscule tolerance in the realm of +/- 0.01 mm/g. The pellets are sold in 5,000 count resealable zip lock bags, with bulk purchase options of 20,000 count and even 125,000 count. Respectively weighing in at 2.2lbs, 10lbs and 50lbs. All shipped for free. When it comes to production quality, MetalTac’s don’t disappoint by any means. They are very well polished, super smooth to the touch and shiny in appearance. The clean polished and slick pellets easily load into my nozzle and feed without issue during play. The described weight and diameter variance of only +/- 0.01 holds true and continues the mantra of “product as advertised”. As for imperfections, MetalTac’s are 100% seamless. Their structure is perfectly spherical as far as I’m able to tell. I haven’t seen any dimples or bubbles. Jamming has never been an issue for me personally, though I have had one report of feeding issues. In my expert opinion, this was caused by the gun, more than by the pellets and it’s probably not even worth mentioning. You should remember, no matter how awesome BBs are – the gun still remains a huge factor in how well your ammo will perform. I’m also very pleased to report that MetalTac seems to produce their BBs in a very consistent manner. The BBs are virtually the same bag to bag and batch to batch. I haven’t come across a bad or underperforming batch so far. As mentioned above, the bags the BBs come in do cause issues sometimes. The seal sometimes comes off the bag, making resealing impossible and rendering the bag useless.. While it doesn’t happen often, it’s annoying when it does and makes transporting the ammo frustrating and bothersome. Pro Tip: Always save at least one of your BB bottles, protein tubs or other applicable storage containers in case your original BB container breaks. Wheres other popular brands often come in bottles or tubs, MetalTac cleverly employs plastic bags exclusively. This is a brilliant way to keep the price low and their product extremely affordable. The BBs are shipped either in a regular box or double bagged. The bags are resealable. Unfortunately the zip lock seal is prone to peeling off. Due to this, some dislike the use of bags and would rather the ammunition come in bottles, which are admittedly easier to handle. An easy compromise is to simply pour the pellets into bottles before going off to the airsoft fields. Sometimes MetalTac goes as far as to vacuum seal their product (maybe on longer shipping routes?). I have only heard it from friends and haven’t experienced it myself. After inspecting and testing how well manufactured they are, I had high expectations when it came to accuracy, flight trajectory and flight stability. Fortunately, accuracy proved yet another instance where MetalTac 0.20g BBs met my already high expectations – with flying colors (pun intended). Their uniformity in construction translated into a very consistent and stable flight path during use. While the occasional spray shot, during semi-auto fire, made an appearance; it was a rare occurrence. All in all, a very reliable performance and very high degree of accuracy for a 0.20g BB. Remember, your accuracy will depend highly on the quality of your gun. MetalTac’s are definitely a very good choice and will in no way worsen accuracy issues. Still, for more powerful guns I wouldn’t substitute MetalTac 0.20g BBs for 0.25g or 0.28g BBs which are inherently more wind and weather resistant. It shouldn’t come as a surprise that a high quality product will enjoy above average durability. This proves especially true with MetalTac BBs. The craftsmanship has greatly contributed to creating a very strong and reliable pellet. The lack of seams or creases immediately provides me with relief in knowing that they are very unlikely to ever break destroy my gun internals. And indeed, they have performed exceptionally well and have never caused me any issues. 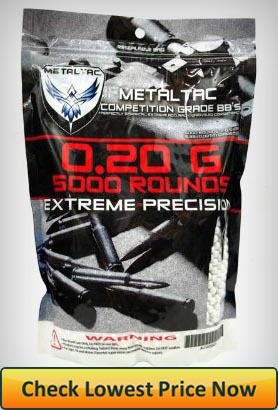 Similar to Valken, MetalTac BBs are very competitively priced. 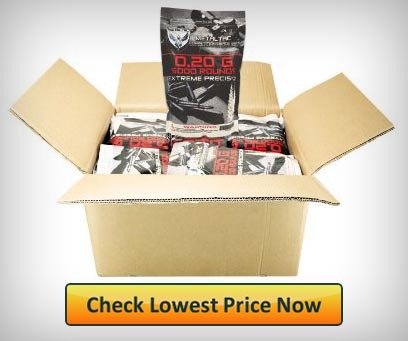 It always brings a smile to my face when a high quality airsoft product is priced with the consumer in mind and not the personal bottom line. In my opinion, it speaks volumes to the integrity and the vision of the brand. Near the top in terms of affordability, MetalTac BBs are perfect for the budget conscious airsoft players! MetalTac 0.20g BBs are an incredible example of exceptional craftsmanship that translates into an accurate, durable and true flying airsoft pellet. Mindful of the the best possible customer experience to a fault and marketed with an outstanding price, MetalTacs are a clear winner in my book. Have you experienced the awesome performance of MetalTac BBs? If so, please let us all know in the comment section below! And if you haven’t, let me know what keeps you from picking up a bag or two for yourself! I’ll answer any and all questions within a few hours!